At the very least the body was moved for better PR. Why? Because the Turkish government is looking for an excuse to offload its refugee camps to Europe. Other things to note: the pristine condition of the body which allegedly had been in the ocean for 3 days. A body in the ocean will normally show bloating, discoloration and markings of predation from fish and birds. This body looks only hours dead at most. The baby’s father had been in Turkey for years, and only wished to go to Europe to get free dentistry and only once the migration had become a difficult to vet flood. So before you throw all of your logic in the trash after seeing a single disturbing image, keep things in context and perspective. 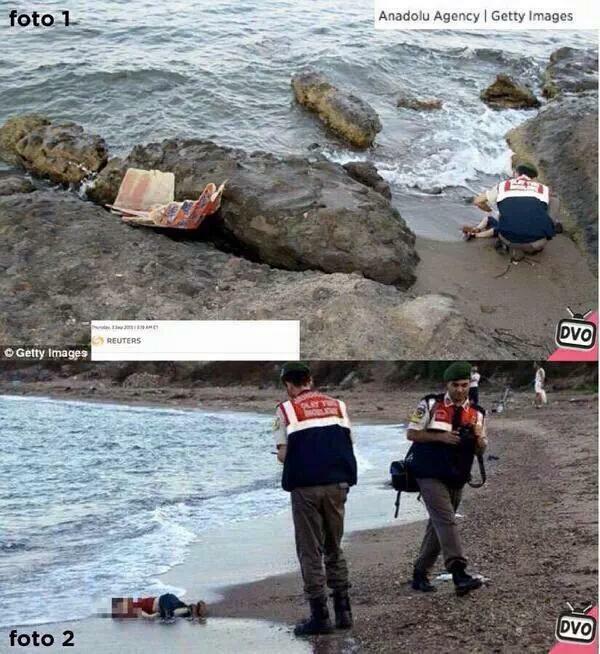 Is one dead baby on a Turkish beach reason alone to change all of Europe’s immigration policy. No, and less so Australia’s immigration policy. And don’t think for a minute that a government wouldn’t go to great lengths to make fake footage of events to drive agendas. Here is the Norwegian government being caught out funding a hoax film of the Syrian civil war. When caught out in the lie, they always revert to attempting to start a conversation about the issue. Posted on September 8, 2015, in Asylum and refugees, Cognitive Dissonance, Europe & EU, Land, Meme, Memory hole, Middle East, Peak Oil, Photo, Politics and tagged baby, drowned, Hoax, Syria, Turkey. Bookmark the permalink. 2 Comments. It gets even better the boy was apparently Kurdish not Syrian. Bendigo Proxy Wars : " Bendigo Action Coalition" = Melbourne " No Room For Racism"